"In that wilderness I lived for four years. God gave me my eating without any toil of mine. Khiḍr the Green Ancient was my companion during that time - he taught me the Great Name of God." Ibn Jarir Tabari (d. A.D. 935), the great Muslim historian, used as a title "The History of Prophets and Kings" for his encyclopedic classic Oevrue for the purpose of emphasizing that Islamic history has a prophetic quality. In Tabari's view, history has been thus suffused with prophecy, to the extent that it is impossible to extricate the ‘sacred' from the ‘profane'. Looking at it with a critical modern perspective, Islamic history revolves around a great many legends and historical events that cannot be proven by modern science. Nevertheless, the great dynamics of Islamic history, in the view of Tabari and other major Muslim historians, has been the Islamic rev­elation and its historical interpretation. The goal of existence in Islam is a prophetic existence. Although prophets are not sinless, they represent the perfect human model, and embody the ultimate human quality in God's eyes. Because of their unique role as the standard bearers of the divine-human and human-divine relationship, prophets become the special focus of human history. There are numerous prophets, ‘saints' and other heroes of Islam who have exerted a great influence on aspects of Islamic history. One among them is Khiḍr. In Islamic folk literature, one finds a variety of names and titles asso­ciated with Khiḍr. Some say Khiḍr is a title; others have called it an ephithet. He has been equated with St. George, identified as the Muslim "version of Elijah" and also referred to as the eternal wanderer. Scholars have also called and characterized him as a ‘saint', prophet-saint, mysterious prophet-guide and so on. These verses primarily deal with an allegorical story relating Moses' journey in search for truth. Full of symbolism, the Qur'ānic story introduces the mysterious figure of Khiḍr, who symbolizes "the utmost depth of mystic insight accessible to man. Khiḍr is not mentioned in the Qur'ān by name. However, the commentators have generally agreed, partly on the basis of Hadīth literature, that the mysterious person with whom Moses' meeting takes place, i.e. the meeting mentioned in 18:65, and who is called in the Qur'ān as "one of Our votaries", is no other than the ‘eternal' Khiḍr. Is Khiḍr a name or does it represent a title? Is he one of the ‘eternal'? Khiḍr is one of the four prophets whom the Islamic tradition recognizes as being ‘alive' or ‘immortal'. The other three being Idris (Enoch), Ilyas (Elias), and ‘Isa (Jesus). Khiḍr is immortal because he drank from the water of life. There are some who have asserted, however, that this Khiḍr is the same person as Elijah. He is also identified with St. George. Amongst the earliest opinions in Western scholarship, we have Rodwell's understanding where he claims that the name "Khiḍr is formed from Jethro." it is difficult to dissociate the figure [of the Wandering Jew] from that of Al-Khiḍr, one of the Arabic prophets. .. With the crusades Europeans became familiar with this legendary figure and out of it developed the character of Ahasuerus or Isaac Laquedem. Haim supports and even quotes Krappe to provide the link between ‘the Wandering Jew legend' and the story of Khiḍr. On the basis of some simi­larities of occupation, Khiḍr is also identified with the prophet Jeremiah or rather it is the other way around; Jeremiah is likened to Khiḍr. As far as the identity of Khiḍr in Islamic history is concerned, there are as many opinions as there are commentators. Enormous detail is found pertaining to his name, genealogy, appearance, origin and status in the chronicles of Muslim commentators and historians since the beginning of Islamic scholarship. Most of this literature exists either in connection with the commentary of S.18 of the Qur'ān, or it is linked with the tales of the prophets (Qisas al-Anbiyā'). Historically speaking, Islam inherited the tradition of Khiḍr from "earlier myths and faiths. Sale has argued that Muslim tradition confounds Khadir with Phineas, Elias, and St. George, saying that his soul passed by a metmpsychosis successively through all three." However, since the advent of Islamic folk literature, Khiḍr has become an integral part of Islamic folklore as well as serious Sufi literature. Just as the figure of the ‘Wandering Jew' became the main allegory of the Jewish people during their diaspora, the figure of Khiḍr became an allegory for the travelling sufis. In the Qur'an the story begins by Moses' declaration to his servant/companion that "I will not give up till I reach the confluence of two oceans". Moses and Joshua had begun to search for "a servant of Allah" from whom Moses was to learn the ‘secret knowledge given him by God. As seen above, Muslim tradition identifies this "servant" as Khiḍr. Qur'ānic commentators have related several opinions with regard to the status of Khiḍr. Some say he is one of the prophets; others refer to him simply as an angel who functions as a guide to those who seek God. And there are yet others who argue for his being a perfect wali meaning the one whom God has taken as a friend. Similarly in S.43:32, the Qur'ān, while expounding one of the characteristics of God's prophets, declares them as "the ones who dispense the favour of your Lord" as against those who are seemingly "wealthy" and hold important po­sitions (chiefs) in this world. Here the Qur'ān argues for the Prophet as the one who embodies God's rahma due to God's will alone and not due to any worldly title or position which he did or did not have. The Qur'ānic usage of rahma here is the same as in 8.18:65. It deals with the quality of being a Rahīm —the "ever-merciful"; the superlative degree of which is applied to God alone. So God being a Rahīm sends His messengers (and prophets) as symbols of His rahma. And as a result they become a chan­nel through which God's rahma is dispensed among mankind. Another prominent example of this is found in S.21:107, towards the end of Sūrat al-Anbiyā', wherein referring to Prophet Muhammad the Qur'ān says, "We have sent you as a benevolence to the creatures of the world", using again the word rahma denoting the sending of the Prophet as "the mercy" from God. Other verses which bear similar association between the prophets and the rahma are S.11:28 and 63 where Noah and Salih respectively speak of God's "grace' and "blessings". In the second part of the same verse i.e., 18:65b, we read, "and [Khiḍr has been] given knowledge from Us." Sale continues the translation of this verse as, "…and whom we had taught wisdom from before us." Amir-Ali puts it as "…and endowed him with knowledge from Ourself." So Khiḍr is a "mercy' from God and he has been given knowledge from God. Here it seems plausible to argue that these qualities certainly allude to his elevated status. To possess divine knowledge is a quality of saints and prophets, but Khiḍr is evidently more than a saint, since he symbolizes God's "mercy" which in the Qur'anic sense clearly refers to prophecy. However, to analyze the subsequent verse of Sūrat al-Kahf, verse 66, in this context, we find that it deals with Moses' request to he instructed by Khiḍr, which, seemingly at least, puts Khiḍr at a higher position than that of Moses. This further confirms the status of Khiḍr as a prophet, as mentioned in the previous verse. As we can see here the translation of tu'allimani is ‘instruct me' or ‘teach me'. Moses, therefore, is requesting Khiḍr to "instruct" him "in the knowledge…of the right way" (S.18:66b). Since Moses in the Islamic tradition is regarded as a prophet as well as a messenger; bearer of the divine command­ments, and conveyer of God's truth to his people, his seeking of knowledge from a non-prophet does not fit the criterion of the divine wisdom given to all prophets. A prophet is rahma of God as well as a bearer of the knowledge given to none other than prophets. It can be said that it would not he possible for Khiḍr, firstly, to have knowledge from God, and, secondly, to "instruct" Moses in that knowledge he is given by God, without being a prophet or for that matter rahma himself. It would be absurd to believe that Moses of all God's messengers was less in knowledge than a non-prophet. On the other hand, it is also argued that Moses with whom Khiḍr's meeting takes place is not the Moses of Banu Israel. In fact there is an hadīth which mentions such a claim while refuting it at the same time on the authority of ‘Abd Allah ibn ‘Abbās. At this point, however, it must be noted that the concept of rahma is closely linked with divine ‘guidance' either in the form of revelation given to the prophets or simply by their mere presence and witness unto mankind. The prophecy of Khiḍr thus is the ‘prophecy of saintship' (nubuwwatu'l-wilāyat) whereas that of Moses is characterized as the ‘prophecy of institution' (nubuwwatu'l-tashrī). Going back to the origin of the story we find a different set of arguments emerging from the rationale behind Moses' search for and subsequent meet­ing with Khiḍr. And this sheds further light on an overall understanding of the story. It begins with Moses making a claim about being the most learned of all men in the world. As we can see, Moses, by holding such a belief, created a necessity of being instructed by someone who surpassed him in knowledge. Although one may argue that the reason for such an ‘instruction' was the mannerism in which he proclaimed it, the fact remains that Moses was the most knowl­edgeable of all men of his time as he was a prophet of distinction in steadfastness and yet there was a sense of ‘the absolute' in his tone for which God had instituted his meeting with Khiḍr. Khiḍr is associated with the water of life. Since he drank the water of immortality he is described as the one who has found the source of life, ‘the Eternal Youth.' He is the mysterious guide and immortal saint in the popular Islamic piety. In Sufi tradition, Khiḍr has come to be known as one of the afrād, those "who receive illumination direct from God without human mediation." He is the hidden initiator of those who walk the mystical path like some of those from the Uwaisi tariqa. Uwaisis are those who "enter the mystical path without being initiated by a living master." Instead they begin their mystical journey either by following the guiding light of the teachings of the earlier masters or by being "initiated by the mysterious prophet-saint Khiḍr." 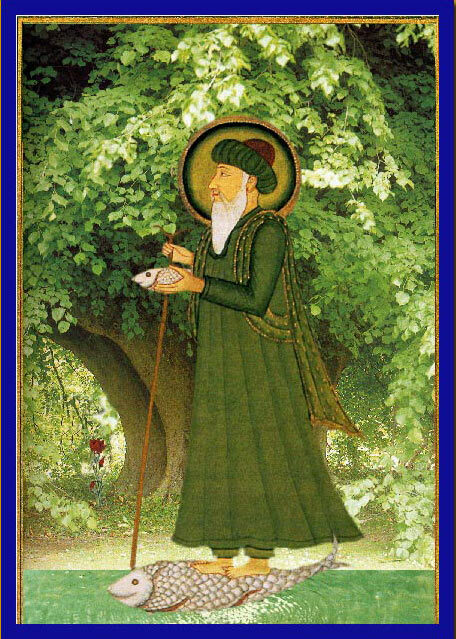 Khiḍr has had thus gained enormous reputation and popularity in the Sufi tradition due to his role of an initiator. Through this way come several Sufi orders which claim initiation through Khiḍr and consider him their mas­ter. It has become yet another possible way of initiation through "a source other than a human master." Besides the Uwaisis, history records that Ibn ‘Arabi, the great mystical giant from Islamic Spain, claimed to have received the Khirqa from Khiḍr. Khiḍr had thus come to symbolize "the third path" to the knowledge of God, purely and constantly supernatural, giving acces to the divine mystery (ghayb) itself. In the writings of 'Abd al-Kartm al-Jili, Khiḍr rules over ‘the Men of the Unseen" (rijalu'l-ghayb)-- the exalted saints and angels. Khiḍr is also claimed by and included among what in the classical Sufism are called the abdāl (‘those who take turns') or the ‘saints' (awliya) of Is­lam. In a divinely instituted heirarchy of such saints Khiḍr holds the rank of their ‘spiritual head. They are called abdāl due to their role of becoming a ‘substitute' for Khiḍr and taking turns in "helping in his mission of assisting and saving good men in danger and distress,"
Here one may ask the question how Khiḍr can relate to a disciple who materially and organically exists in this world of space and time! In other words, as Corbin puts it, is the "disciple's relation to Khiḍr similar to the relation he would have had with any visible earthly" master! It seems, as Corbin also suggests, that questioning the nature of such a relationship is to question the historical existence of Khiḍr himself. Whereas Khiḍr, as we know, is ‘transhistorical' and by virtue of being "immortal" transcendant. Further the danger in describing the phenomenon of Khiḍr is more than real. If, taking the standpoint of analytical psychology, we speak of Khiḍr as an archetype, he will seem to lose his reality and become a figment of the imagination, if not of the intellect. And if we speak of him as a real person, we shall no longer be able to characterize the difference in structure between Khiḍr's relationship with his disciple and the relationship that any other shaykh on this earth can have with his. Hence the experience of being a disciple of Khiḍr "invests the disciple, as an individual, with a transcendant ‘transhistorical' dimension." It is an experience which lies beyond the spatio-temporal conditions of our sense perception. You and I are not compatible, for you have drunk long draughts of the water of immortality so that you will always exist, and I wish to give up my life. Khiḍr literally means ‘The Green One', representing freshness of spirit and eternal liveliness, green symbolizing the freshness of knowledge "drawn out of the living sources of life." It implies regeneration as Schwarzbaum has pointed out. 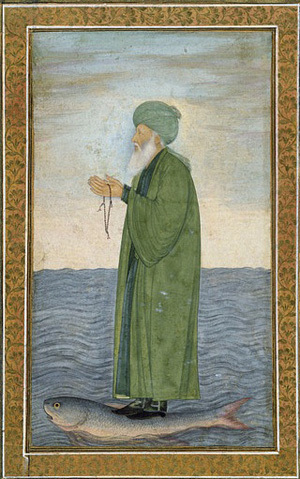 The color green has also been related to Khiḍr's disappearing ‘into the "green landscape' after departing from Moses. It is a sort of ‘be­coming green', or by way of disappearing and teaching a lesson, making knowledge ‘afresh' for the one who is being taught. It is afresh because it is "drawn from Allah's own knowledge." ... he [Abdul Khayr] would flee to mountains and wilderness, where he was sometimes seen roaming with a venerable old man clad in white raiment... [who as] he declared [later] was the prophet Khadir. Besides the symbolism which revolves around the figure of Khiḍr him­self, the story of Moses and Khiḍr is full of other imageries and divine allusions. First of all there is a mention of the fish which is a symbol of knowledge; then there is mention of water, a symbol of life, as well as the sea, symbolizing the limitless immensity and vastness of knowledge, especially esoteric knowledge. The reason why Joshua may have forgotten to tell Moses about the disap­pearance of the fish is yet another sign alluding to the divine mystery. Regarding this Shāfi' says: Maybe he (Joshua) forgot due to the reason that his thoughts wandered away thinking about his homeland, since he is in travel. The twist here is in the link between the symbolism of the ‘fish' (a way of knowledge) which is being carried during the travel (jihād: one of the means of knowl­edge) in order to arrive (understand) the ‘meeting of the two oceans' (the perfect knowledge). The two oceans, once again, are parallel to the two kinds of knowledge, the exoteric (that of Moses) and the esoteric (that of Khiḍr); ‘perfect knowledge' is the coming together of the two. Furthermore, travel is inevitably linked with the attainment of divine wisdom. Hence another aspect of Khiḍr, as patron-saint of travelers, is highlighted in the tradition. However, whatever may be the reason for Joshua's forgetfulness, it certainly seems to contain yet another moral for the humankind. In his case the ‘forgetting' was more than forgetting. Inertia had made him refrain from telling the important news. In such matters inertia is almost as bad as active spite, the suggestion of Satan. So new knowl­edge or spiritual knowledge is not only passed by in ignorance, but sometimes by culpable negligence. Overall, the episode of Khiḍr in the Qur'ān is a reflection and representa­tion of the paradoxes of life. Above all, it symbolizes the delicate balance between ‘patience and faith as they were enjoined" on Moses after he understood the meaning of those paradoxes explained to him by Khiḍr himself. What is implied by the story is that such wisdom is only attainable by the will, mercy, and grace of God, and that even the prophethood and bearing of the divine law could not bring that "most subtle knowledge" because it is "only known to him who has become the instrument of God." Thus is Moses given a lesson by God about the infinitude of knowledge, with subtle but momentary knowledge belonging to Khiḍr, but universal knowledge to Moses. As it may be said here, there is a sense of Khiḍr being ‘superior' to Moses. Based on that, one may suggest that there are "glimmerings of a theophany" in the personage of Khiḍr who as God's servant is as human as Moses, yet seems to be embodied with the divine attributes of "God's mercy [rahma] (eternal salvation) and...Divine knowledge (eternal prescience)." Symboli­cally it may imply that Moses' encounter with Khiḍr is actually his encounter with the aspects of the Divine in an attempt to equip him (i.e. Moses) with the infiniteness of knowledge. As Netton has rightly said, it may all be summed up as a Divine Testing of Moses. The legend of Khiḍr is an excellent example of the fact that human beings constantly need to seek the union with God in Whom all knowledge rests. Since there is no end to the divine knowledge, it is unwise to assume, as Moses did, that one may know it all. The episode in the story of Moses is meant to illustrate four points… that wisdom [does] not comprehend everything, even as the whole stock of the knowledge of the present day, in the sciences and the arts, and in literature…[is accumulated] (if it could be supposed to be gathered in one individual). (2) Constant effort is necessary to keep our knowledge square with the march of time. (3) There is a kind of knowledge [like the one Khiḍr represents] which is in ever in contact with life as it is actually lived. (4) There are paradoxes in life: apparent loss may be real gain; apparent cruelty may be real mercy...[and that] Allah's wisdom transcends all human calculation. In conclusion, it is to be noted that the symbolism of Khiḍr has traveled far and beyond the geographical as well as ideological boundaries of its origin. The legend has truly lived up to its universal quality as it spreads across a variety of cultures and civilizations around the world. In the subcontinent folklore Khiḍr has appeared "as a substitute for the Hindu gods of the water and is particularly revered by sailors and fishermen." It is in connection with Khiḍr being a patron-saint of sailors that his name is invoked down to this day by the sailors every time a boat is being launched in parts of the Middle East and Northern India. 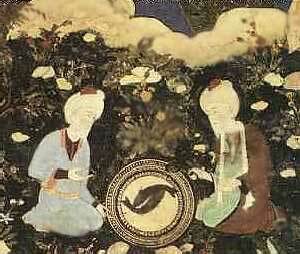 Today Khiḍr can be found in the verses of Iqba1, in the poems of Rumi, and ‘Attar. He has immensely influenced the lives of many a mystic, ascetic and man of God throughout the history of Islam, such as 'Abd al-Karim al-Jili, Ibn ‘Arabi, Mansur al-Hallaj and so on. In the Muslim tradition Khiḍr is alive and well and continues to guide the perplexed and those who invoke his name. I am indebted to Dr. Ibrahim Abu-Rabi and Dr. Willem A. Bijlefeld of Hartford Seminary for their invaluable comments and suggestions in the formation of this essay. Sufi Ibrahim abn Adham quoted in the article on ‘Khiḍr' in Cyril Glasses The Concise Encyclopedia of Islam (San Francisco: Harper and Row, Publishers, Inc., 1989), 224-25. Cf. Mahmoud M. Ayoub. Islam: Faith and Practice (Markham, Ontario: The Open Press Limited. 1989), 33-34; 65b. Although this is the common translation of Wali, Pir and other related Islamic terms, it nevertheless obscures the considerable diversity underlyimg these terms. See PM. Currie, The Shrine and Cult of Mu'in al-Din Chishti (Delhi: Oxford, 1989), 1. Khiḍr is spelled in several ways: al-Khadir (in Oriental/German scholarship), Khezr and Khizr (in Persian and Indian accounts) and so on. See note 73 in Muhammad Asad, The Message of the Qur'an (Gibralter: Dar al-Andalus, 1980). 449; c.f. A.J. Wensinck. ‘Khadir' in The Encyclopedia of Islam no. 29 (Leyden: E.J. Brill. 1925), 861. Extensive literature and references on al-Khiḍr are included in Haim Schwarzbaum's Biblical and Extra-Biblical Legends in Islamic Folk-Literature (Waldorf-Hessen Verlag fur Orientkunde, 1982), 17-18. S.18:65 in the Qur'ān, tr. Ahmed Ali (Princeton. NJ: Princeton University Press, paperback edition, 1988). 256. Asad, The Message of the Qur'ān, 449. Yusuf Ali translates it as "one of Our servants." The Holy Qur'ān (Lalmore: Shaikh Muhammad Ashraf, 1938), 748. Annemarie Schimmel, Mystical Dimensions of Islam, (Chapel Hill: University of North Carolina Press. 1975), 202. "Muslim version of Elijah" George K. Anderson. The Legend of the Wandering Jew (Providence: Brown University Press. 1965), 409; Exhaustive material on Khiḍr's resemblance with Elijah is presented in Friedlaenders "Khiḍr" in the Encyclopedia of Religion and Ethics (New York: Charles Scribner's Sons, 1915), 693-95. Peter L. Wilson, "The Green Man: The Trickster Figure in Sufism", in Gnosis Magazine 1991, 23. On Rodwell, see W.M. Thackston Jr.. The Tales of the Prophets of al-Kisai /(Boston: Twayne Publishers, 1978), xxiv. Alexander H. Krappe. The Science of Folklore (New York: Barnes and Noble Inc., 1930), 103. However, he refers to the Wandering Jew as Ahasver. See Haim Schwarzbaum. Biblical and Extra-Biblical Legends, 17. Schwarzbaum mentions several references to it in his excellent work Biblical and Extra-Biblical Legends. For instance Tabari's Tatsir (Cairo: 1373). v. III, 28-29; and Tha'labi's ‘Ara'is al-Majalis (Cairo: 1324), 126. It is the intermingling with the wild beast which links Khiḍr to the prophet Jeremiah. I. Friedlaender has further linked it back to the legend of the ‘Wandering Jew.' See Schwarzbaum, 167-68. Historical identity here does not mean determining the actual person of Khiḍr in history but as it is related in the "divergent sources" such as prophetology, folklore, etc. See Henry Corbin. Creative Imagination in the Sufism of Ibn ‘Arabi (Princeton: Princeton University Press. 1969). 55. Peter Wilson, "The Green Man…" Gnosis. 22. George Sale. The Koran, (London: William Tegg. 1961), 244. See A.J. Wensinck for his valuable analysis of these links in his long article on "al-Khadir" in The Encyclopedia of Islam, 862. The Holy Qur'ān edited by The Presidency of Islamic Researches, IFTA. (Madinah: King Fahd Holy Qur'ān Printing Complex. 1410 A.H.), 840. S.18:60 Qur'ān. translation of Ahmned Ali. 255. Sultan Hasan, ‘Irfan al-Qur'ān (Agra: Maktaba ‘Irfan. n.d.). 113. Hashim Amir-Ati, The Message of the Qur'ān: Presented in Perspective (Rutland, VT: Charles E. Tuttle Company, 1974), K-30. Sec. 328-330. George Sale, The Koran, 244. Note that here Ahmed Ali translates rahma as ‘benevolence'; cf. A. Yusuf Ali's translation as ‘mercy'. See Hifzur Rahman. Qisasul Qur'ān, (Delhi: Nadwatul Musannifin, 1975), pt. l, 545; cf. lan Richard Netton. "Theophany as Paradox: Ibn ‘Arabi's Account of al-Khadir in his Fusus al-Hikam" in the Journal of the Muhiyiddin Ibn ‘Arabi Society XI: (1992), 18. Hifzur Rahman. Qisasul Qur'ān 538; cf. Thackston, The Tales of the Prophets, 208. Moses received the ‘guidance' (revelation) as well as the ‘mercy' from God whereas Mary received only the blessings and the ‘mercy'. Cf. 6:154. 7:52: 19:21. R.A. Nicholson. Studies in Islamic Mysticism (Cambridge: The University Press. 1921), 141. Muhammad Shafi. Ma'arif al-Qur'ān (Karachi: Dar al-Ma'arif. 1978). vol. V: 591. J.M.S. Baljon. (tr.). A mystical Interpretation of Prophetic Tales by an Indian Muslim: Shah Wali Alla's Tawil al-Ahadith (Leiden: E.J. Brill. 1973). 39-40. Muhammad Shafi. Ma'arif al-Qur'ān. 591. Netton. "Theophany as Paradox", 18. R.WJ. Austin, The Bezels of Wisdom (New York: Paulist Press. 1980). 250. Cf. Schimmel. Mystical Dimensions of Islam. 106. Schimmel, Mystical Dimensions of Islam, 106. Wilson. "The Green Man, in Gnosis, 23. They are called Uwaisi after time name of Uwais al-Qarani, a contemporary of the Prophet who "lived in Yemen amid converted to Islam without ever meeting the Prophet.' Since Uwais had no visible human guide, he became the model for those who are content with a ‘hidden' master; one of the most famous was Abu'l-Hasan Kharraqani. See Schimmel, And Muhammed is His Messenger: The Veneration of the Prophet in Islamic Piety. (Chapel Hill: The University of North Carolina Press, 1985), 22; and Corbin. Creative Imagination, 32, 53-54. Schimmel, And Muhammed is His Messenger, 22: Cf. Vollers, K. "Chidher." A.R.W. (Archiv fur religiose Wissenshaft), XII (1909), 252ff. Schimmel, Mystical Dimensions of Islam, 105-6; See also Corbin, Creative Imagianation 63-67, for a detailed exposition of this. Louis Massignon, The Passion o fal-Hallaj, Herbert Mason tr., II (Princeton: Princeton University Press, 1982), 54. Nicholson Studies in Islamic Mysticism, 82. Not a Qur'anic doctrine but mentioned in hadith, the abdal are first mentioned in Imam Ibn Hanbal's Musnad. See Virginia Vacca, "Social and Political Aspects of Egyptian and Yamani Sufism", in the Journal of the Pakistan Historical Society 8:4 (October 1960) 233-34. Louis Massignon quoted in Vacca, Ibid. note 1. 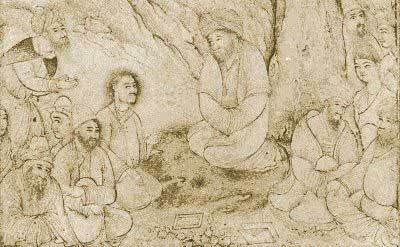 Farid al-Din ‘Attar, Mantiq Uttair (The Conference of the Birds). S.C. Nott. tr. (London: The Janus Press, 1954). 17. Holy Qur'ān (Madinah: 1410 AH). 840 n. 2411. Schwarzbaum, Biblical and Extra-Biblical, 18. Jan Knappert. Islamic Legends: Histories of the Heroes Saints and Prophets of Islam, (Leiden: E.J. Brill, 1985). 116. Holy Qur'ān (Madinah: 1410 AH). 840, n. 2411. See Schimmel. And Muhammad is His Messenger, 39. Nicholson, Studies in Islamic Mysticism, 13. "Fish is the emblem of the fruit of secular knowledge" A. Yusuf All, Holy Qur'ān (Lahore: 1938), 747 n. 2408. "The salt sea of this world represents, like Moses, exoteric knowledge, whereas the Waters of Life are personified by al-Khiḍr." See Martin Lings. Symbol and Archetype: A Study of the Meaning of Existence (Cambridge: Quinta Essentia, 1991), 75. Yusuf Ali, Holy Qur'ān (Lahore: 1938), 748 n. 2410. Ibid. See summary on p. 727. Baljon, Mystical Interpretation of Prophetic Tales, 41. Ibid. Similarly, for Vollers the main issue is theodicy: What may seem wrong to us (in Khiḍr's actions) can be right in God's judgement. Netton, "Theophany as Paradox." 12. Holy Qur'ān (Madinah: 1410 AH. ), 838; A. Yusuf Ali, Holy Qur'ān, (Lahore: 1938). 747. Currie. The Shrine and Cult, 10; cf. Friedlaender, "Khiḍr" Encyclopedia of Religions and Ethics, 695. As in "Asrar-i-Khudi" and other poems.